Today I have a fun giveaway to share! If you aren't familiar with this line of clothing, go take a peek. Shabby Apple is a boutique filled with beautiful, vintage inspired clothing, "... a fashion company for women, by women, and of women". 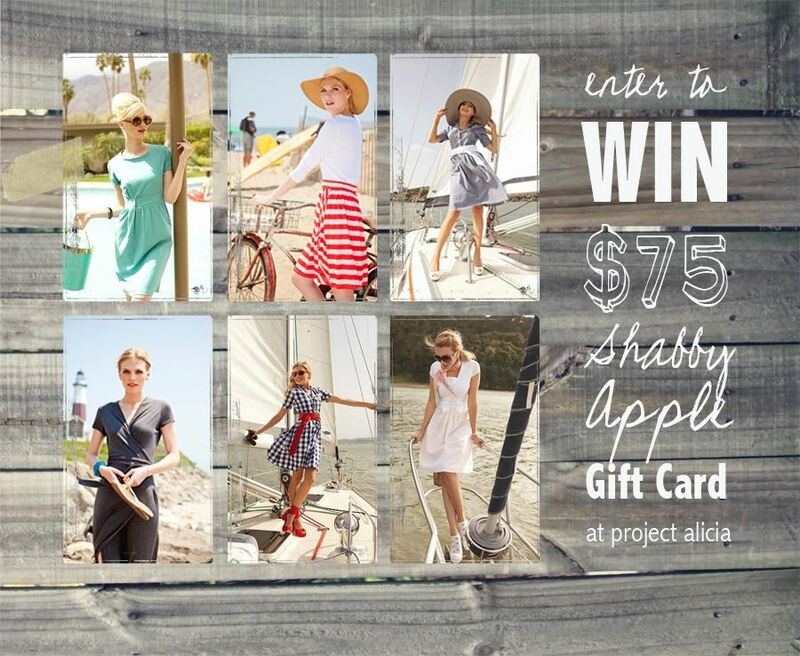 And Shabby Apple is offering one lucky reader here at Project Alicia a $75 gift card! Just follow the directions to be entered to win. And tweet or share on facebook daily for additional entries! Contestants must have a USA shipping address to be eligible for entry. This giveaway will be open for one week through Tuesday, July 24th at Midnight EST. Winner will be chosen at random and has 48 hours to claim their prize or another entrant will be selected. If you can't wait to start shopping, you can get 10% off at checkout using the coupon code projectalicia10off, good for one month through August 17th. Disclosure: Thank you to Shabby Apple for making this possible. I am not being compensated for doing the giveaway. All opinions are my own. What don't I LOVE? Hello STRIPES!!!! I love so many things I don't know how I'll decide! Probably the headliner dress or the waterfront dress! I like the im late! im late! dress. I love the Key to Wonderland necklace! I like the CIDER dress and ELIZABETH ISLANDS! The I'm Late! I'm Late! dress. love them all. The trade sails one I want so bad!!! "Check out the Shabby Apple $75 giveaway at ProjectAlicia.com!" I love the lacey, seafoam of the Alice dress the best! I LOVE most of their dresses, but I think I'd purchase Serenade! Love it! The Tulleries dress is adorable and my fav! Thanks for the awesome giveaway. I like the Bistro Blouse. I love the look of the Study Break dress! I love the Elizabeth Island dress. I am in love with the Race point skirt, but it was incredibly hard to narrow it down to one thing!! I love the Heart Of Me dress! I pretty much like most of them. I LOVE Overboard. Great dress. It's too hard to pick! I adore the Martha's Vineyard dress. I like the Mulholland dress. i love the toe the line dress. so simple and beautiful. LOVE the Bon Voyage dress! Favorite item is the Bon Voyage dress. I love the fifth ave. dress! I love their gray fox dress! I like the Bon Voyage dress! Love the Walk the Plank dress!! I like the Rhapsody dress.